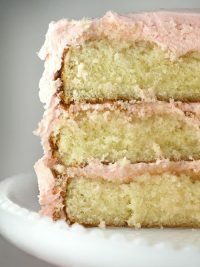 The Super Bowl will be on in a few hours so I thought I would go ahead and share some sweet treats worth cheering for. That is if you are a Pittsburgh Steelers fan. My friend Cupcake Julie and her husband are. Big fans. Me? Not so much a football fanatic or watcher for that matter. 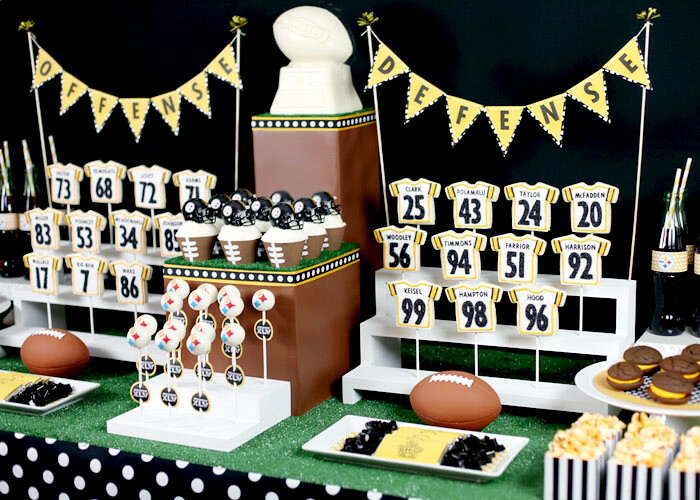 But I am a fan of fun and cute treats, so when Julie asked me to help with her Steelers Sweets Dessert Table I was all in. But how could I not be. Remember her Christmas table? Enough said. 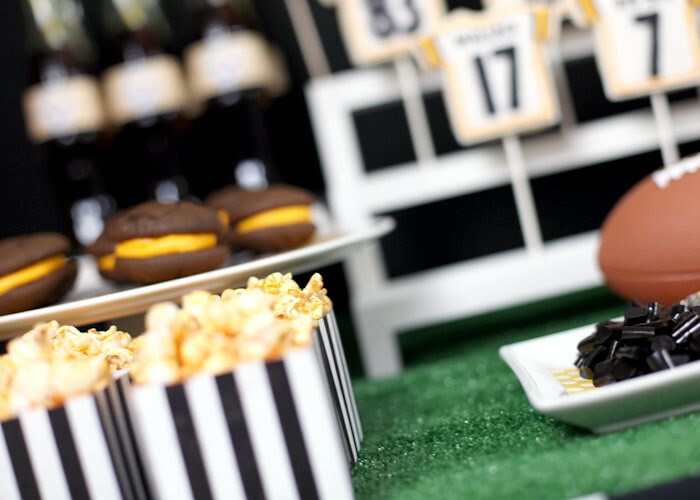 I made some Steelers cake pops and chocolate whoopie pies for the table. 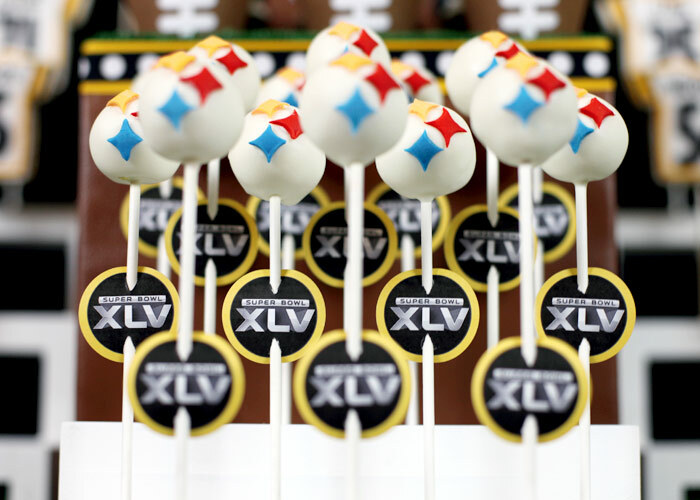 But these football jersey sugar cookie pops that Julie made were the star attraction. They were placed on custom bleachers measured, made and painted by Mr. Cupcake Julie. Teamwork is awesome. …With the defense on the other end. Complete with the names for each. 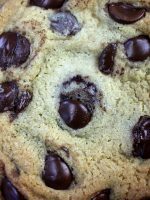 Love the look of these cookies. They were made from a onesie cookie cutter and turned into jerseys by just cutting off the bottoms. 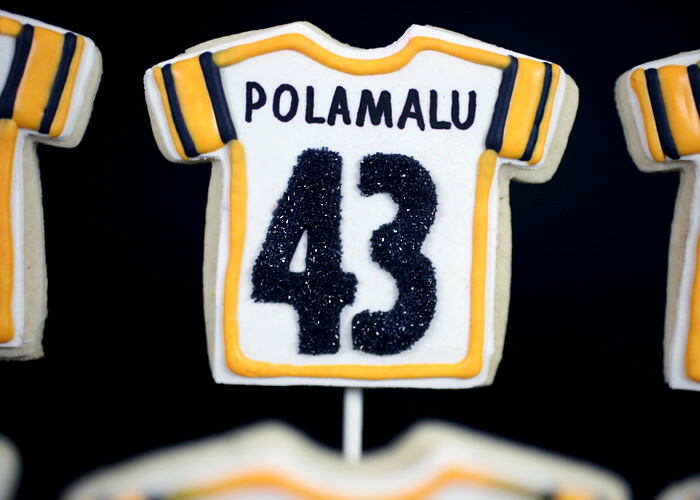 Polamalu … He was named the NFL’s Defensive Player of the Year. I didn’t know that before yesterday or that this is the third Super Bowl for the Steelers in five years… or that they are trying for their 7th Super Bowl win. I could go on … and on with what I didn’t know about the Steelers before yesterday. 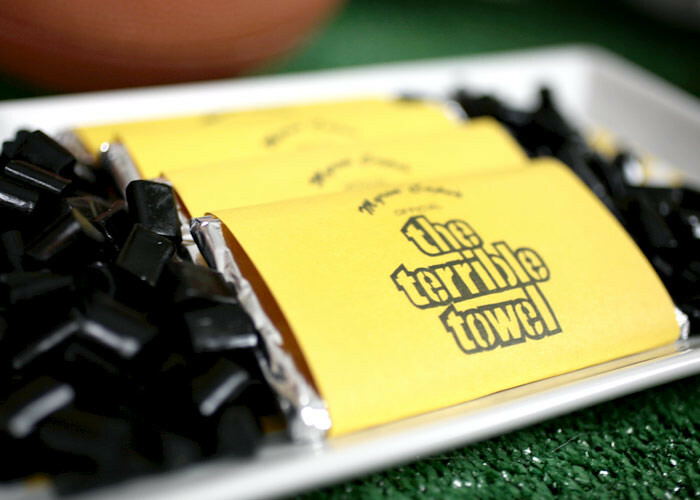 …Like what a terrible towel is… but if you are part of the Steeler Nation, I think you’ll appreciate these cute little labeled candy bars with a bit of licorice on each side to color coordinate. There was even a football trophy made of chocolate. Julie had a metal cake pan she used for the mold. Of course, we need something to wash it all down. 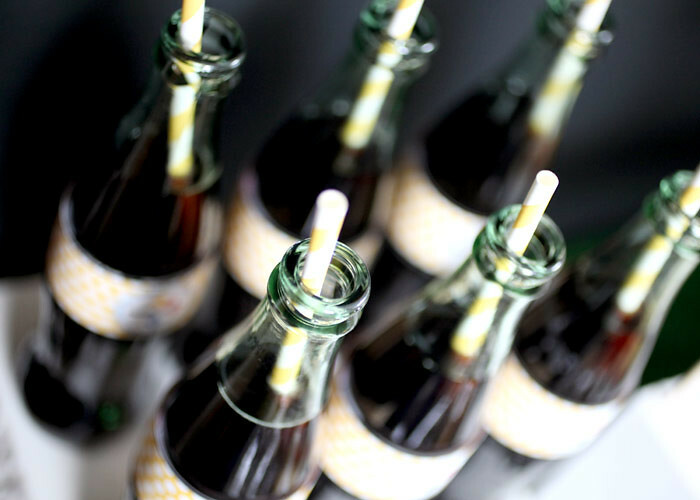 Coke bottles won so we could add our own labels and use these cute yellow striped paper straws for a fun look. 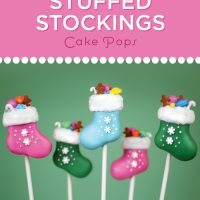 The cake pops were dipped in white candy coating. 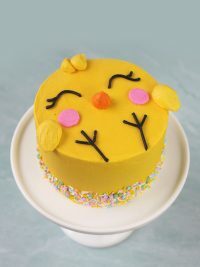 The stars were made by cutting the shapes out of tinted fondant and attaching them to the pops with some of the extra melted candy. And the tags were made using a 1 1/2 inch paper punch to cut circles from card stock paper and a teardrop shape hole punch for the holes. You can size your own artwork to fit whatever size paper punch you have and print it out to use. 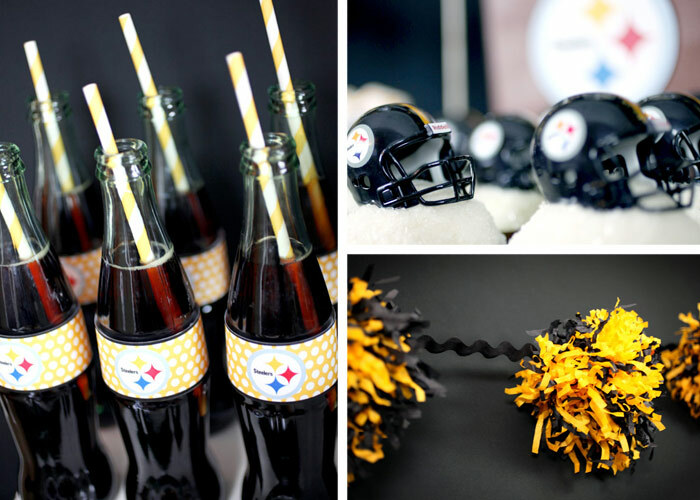 Check out these cupcakes with cute football wrappers and these awesome Steelers helmets. 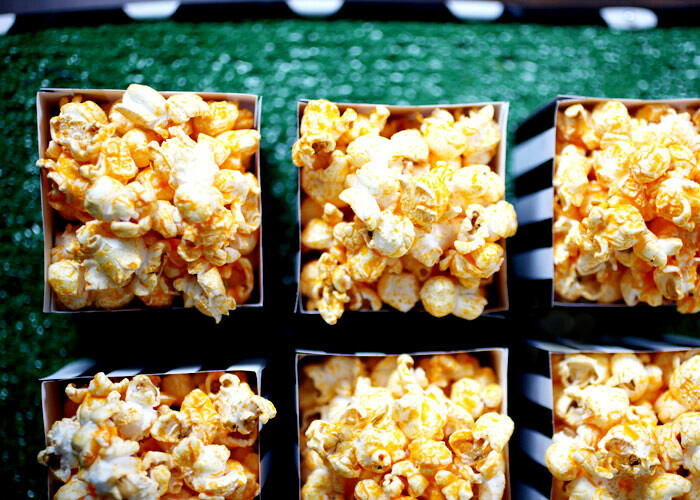 We made striped boxes in black and white for popcorn. Simple stripes, but a very strong graphic element and really pulled the look of the table together. Julie happened to have a bunch of those paper pom poms being the super fan that she is, so she cut them in half and wired them in bunches to make them smaller and fuller. They added great texture to the background. We both had so much fun pulling this all together. I’ve really got to be careful though, this kind of thing could be very addictive. 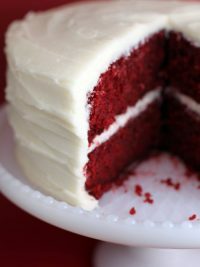 I have visions of dessert tables swirling in my head. Are you watching the Super Bowl? Me? It looks like I’m a Steelers fan after all that work. At least until Glee comes on. Crazy cute!!!! I’m with you on waiting for Glee…. 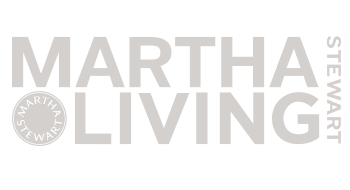 WOW – this is amazing! Wish you could “pack” it up and send it to me in PITTSBURGH!!!!! GO STEELERS!!! I’m cheering for the Packers, but this display is awesome! 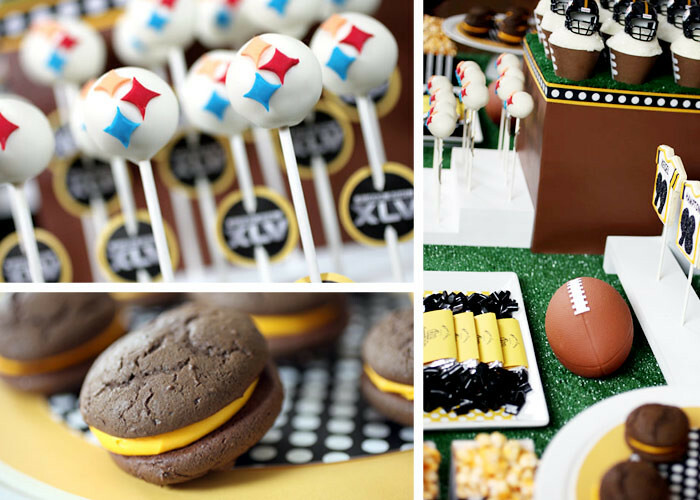 The only thing missing are football cake pops! 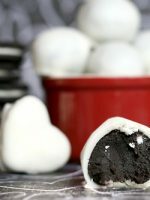 [I made some last year and everyone went wild for them: http://bakedwithloveandbutter.blogspot.com/2010/02/football-cake-pops.html ] Happy Superbowl Everyone! I only care about Glee, not the football. But this is the cutest! So disappointed you didn’t do a Green Bay batch. But I guess these will get eaten just like the Steelers will in a couple hours. So amazing! I don’t care who wins but I could get behind the steelers just because they’re colors look so good on this table! One of my girlfriends is a DIE HARD Steelers fan and is going to freak out when I show her this table. I will be watching the Super bowl, but have no favorite for the Atlanta Falcons didn’t make it this year. Go Sweets! Just awesome. wish I would of found your site awhile instead of a a few days ago. I love the Steelers and this gave me ideas for next year. What a fabulous spread! 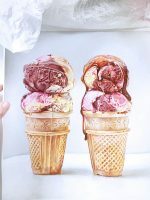 Your creativity will never cease to amaze me :) I’ll be watching the game I’m sure in between baking I hope.  Lots of items on my list I want to make. Wow, I’m not much of a football fan unless I have some sort of emotional/sentimental attachment to a team, like these goodies for instance-ha ha! You are so AMAZING! Thank you for sharing. LOVE all of it : ) even the team you are rooting for. 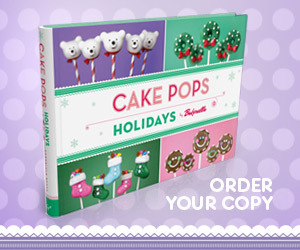 We’ll be watching and enjoying a few cake pops ourselves. Wow Wow Wow! What an impressive table! I’m a bit out of touch with football now since moving to the UK. Here football = soccer. Hope you have a fab game day! 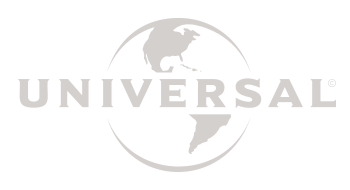 I wish I could be there – mainly just to watch all the cool commercials! PLEASE start a blog!!!! You are out of control talented! This table has me speechless. Jenny – Yes, but we have more to drink. Jenny – I agree. I keep telling her. holy crap that’s amazing! great job! Simply amazing!! I could never put that much effort into a tablescape/decorating desserts..
You are absolutely insane! This is crazy amazing! Ummm… WOW! This is incredible…. like too cute eat incredible. It all looks great, but the cookies sent me over the edge! Great job ladies! Ahh! This is amazing! Every time I look at your cute little things, I think about how time consuming it must be to have everything so perfect. Awesome job!! I usually don’t watch the Super Bowl unless my team is playing. I do love the commercials though. Have you seen the Volkswagen Star Wars commercial? Love it. Amazing!! Can I come to your party?! Wow. I’m not even really a football fan…..but I AM a party fan! Love it all!! How did you make the black and white striped boxes? Awesome design! I love my Steelers! This is just perfect! WOW! You two rocked it!! I am not much for either team or football for that matter. We are doing the unthinkable, going out to dinner then grocery shopping. LOL Hope that isn’t too un-american, LOL! not a steeler’s fan, but this is incredible! I could care less about the game, but I do love all the fun treats! those jerseys are amazing! If I didn’t already ADORE you this would have clinched it! You ROCK! My hubby is a HUGE Steelers fan, and I cannot wait to show him this! Can you be any cuter!?!? I want to come to your place for the Super Bowl! Dessert Tables are so addicting! 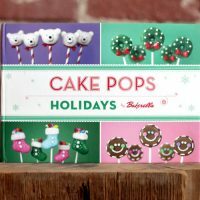 Have you heard of candy clay? It is pretty much the greatest thing ever invented. 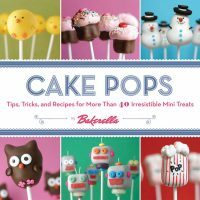 It would work perfectly instead of fondant on the cake pops. Plus it tastes just like the candy coating. agh! Loveeeee it!! And those cheerleader pom poms are so cute too!! 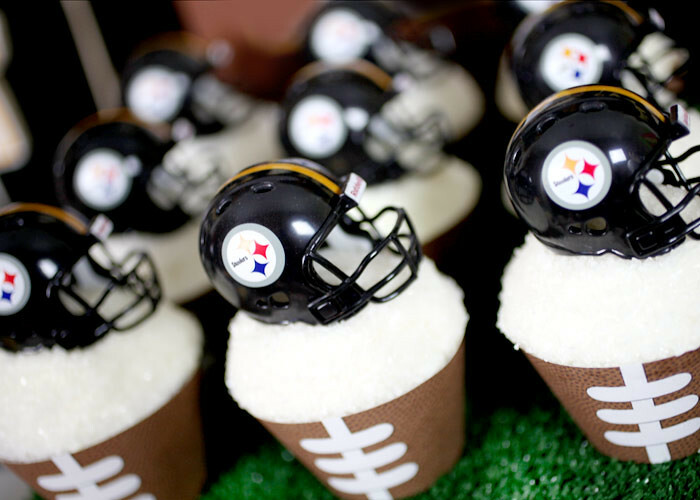 As a Steelers fan myself–I LOVE these–but darn it’s all too cute to eat!! What a lot of work y’all put into these—and they look so great! That’s artistic IMO. Next year Detroit is going all the way, baby! How AWESOME! I still dream about her Christmas Party Table, now this awesome table?!? WOW! I wish I could learn how to set us my yum Yuma like that!!!! I love football! I will be watching! I’ll be going cheer for the Pack, even though Brett Favre isn’t on the team anymore. Holy Cow! I’m not a football fan, but I want to go to that party! Btw, what’s a terrible towel?! You are amazing! Oh, and I can’t wait for the new Glee!!! Even though I’m rooting for the Packers.. That is quite the table. The work you and your friend put into that table shows though. Your desserts look amazing Julie!! Have fun enjoying them as our Steelers shred the Packers!! GO STEELERS!!!!!!!  I personally watch for the commercials… ;) LOVE the table and all the fun ideas! 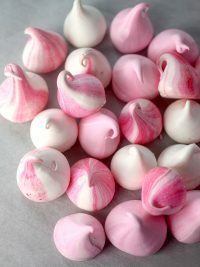 Love, Love, Love these!!! If I show my husband these pictures, he will want me to do these for him every year!!! Go Steelers!!! The only thing that could have made this display better is if you had shared it yesterday, so I could borrow some ideas for today!! Perfect!! GO STEELERS! Any man would love this dessert table! Fabulous!! You would like this lady. Just a question–how do you get your candy coating so thin for such smooth coverage? No matter how thoroughly I melt mine, it’s always thick and doesn’t get nearly the same even coating. 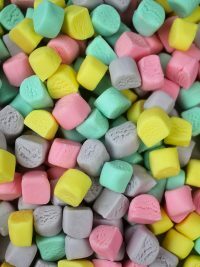 Do you add anything to the candy melts to make it thinner?  What brand do you use? I too would love to see a blog but maybe you should should just skip it and publish a book. These pics are coffee table worthy! 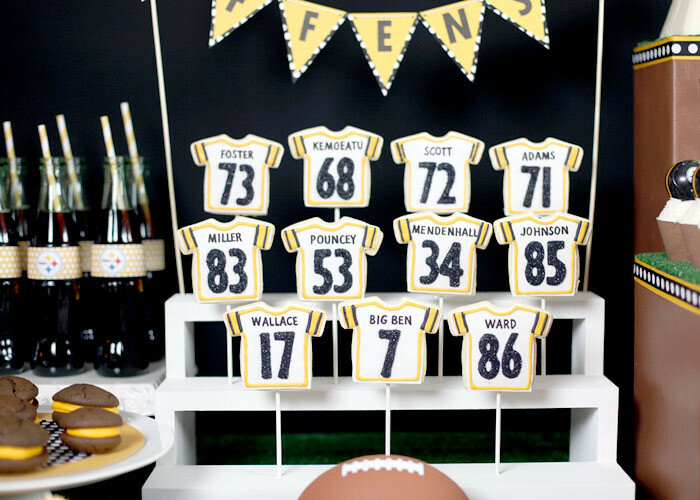 As a Steelers fan and cake pop fan, this is quite possibly the best table of desserts ever! Great job woman! Amy atlas would even be proud! Thanks for sharing!! Maybe next time I’ll do all this!! how cute! that is awesome. I am trying to make my son, who will be 8 tomorrow, who, is a Steelers fan, some of the steelers football pops. How do you make the footballs, look like footballs??? help asap!! I’m not sure how to form them. Wow! That dessert table looks amazing. I wish I had your advice about the steelers pops before today! Anyhow…..I am definitely rooting for the steelers!! 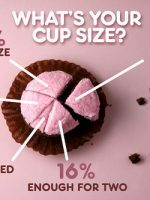 Love your super bowl dessert table. So many goodies!!! This. Is. Too. Much. I. Have. Failed. 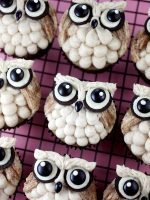 My Superbowl-ness pales incomparison to these delightful treats. Wow. 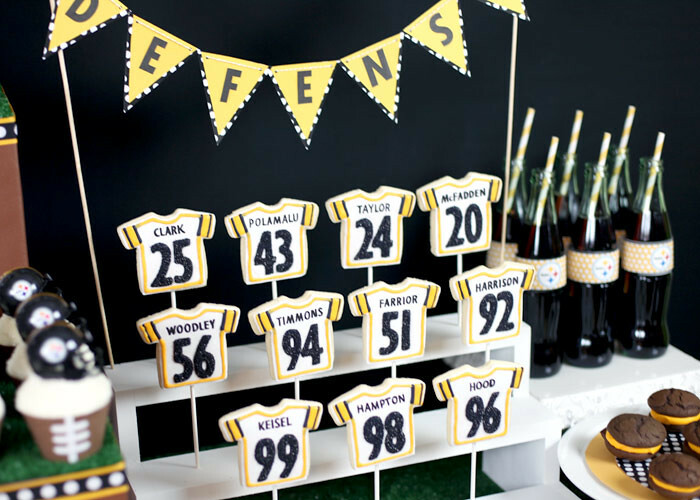 I am totally not a football fan but I am making all kinds of mental notes because I would love to make a snack bar that looks like this for a hockey watching party! OMGoodness!!! I would have been totally ALL IN on this project too! I LOVE themed gatherings!!! I just finished up some pops for a friend to take to a super bowl party. They are so cute…especially the footballs!!! 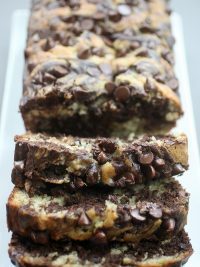 Next time you want to go all out on a dessert table…call me….I love this stuff!!! Thanks for sharing! Keep them coming!!!! 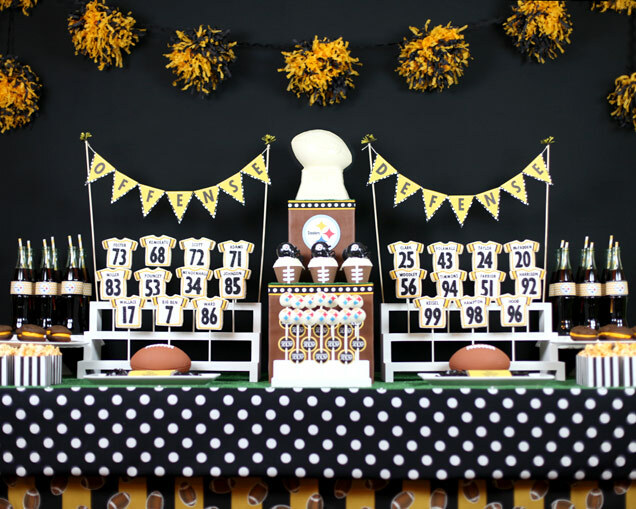 What an amazing Steelers dessert table, this is definitely the Super Bowl party to be at this year! You all did a fabulous job with all the details and variety of sweets! Love the jersey cookies in the custom bleachers! Born and raised a Packer fan, and that will never change. GO PACK GO! We’ll be waving our Terrible Towels in less than an hour :) Beautiful job! I had hoped to make some stellar sugar cookies for our Super Bowl party this past week but my little kids got pink eye so we had to cancel. I’ll store some of these great ideas for next year! Adorable table although I am not a fan of football either, just yummy desserts. And a homerun again! (Okay that doesn’t fit for football…Iknow that… but I don’t even know what it would be called in this case, I’m THAT much into sports!). Like you, I’m into sweets though, and this table is to die for. I love love love the ‘stands’ and the adorable cookies ‘sitting’ in them and I could really go for one of those cake pops right now. You are amazing!!! I love it! 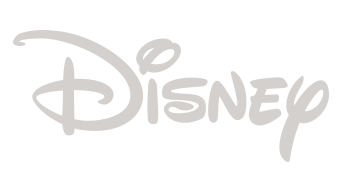 when I saw this pictures it came to my mind…. 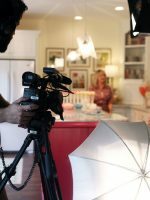 bakerella meets amy atlas! the best mixture ever! There have been many times that I’ve looked at your blog and thought to myself, “Only an insane genius would put that much work into something somebody is gonna eat.” Today, I think you’ve outdone yourself! This is absolutely fabulous! Hoping to do something like this for next years super bowl….lets hope in silver and blue!! Oh no, I thought you were perfect…I’m talking myself into believing that you just got your colors confused this time…I’ll have to send you a pic of my CHEESEcake…GO PACKERS!! !